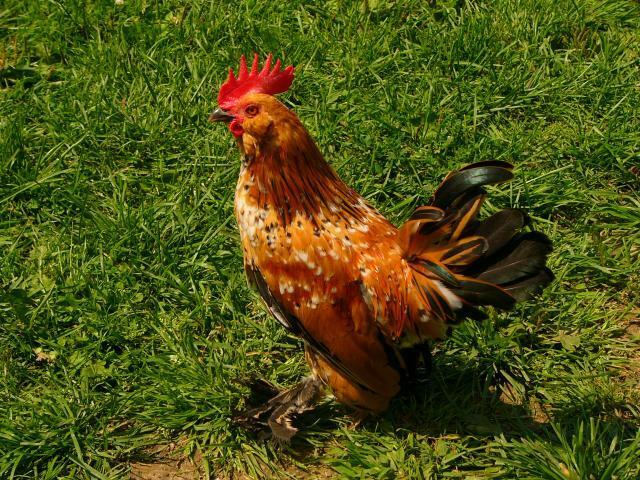 Mille Fleur Rooster worth showing? Discussion in 'General breed discussions & FAQ' started by LovinMyPeeps, Aug 6, 2009. I have a young mille fleur d'uccle roo named Nugget that is blossoming into a beautiful bird. He's only 14 weeks but is sweet and easy to handle not to mention has nice markings and form. I have looked for prize winning d'uccle and think he might be show worthy. He is coloring in with amazing mahogony saddle feathers and has a stunning tail, green black reminiscent of a mallard head. What is your opinion?? I've never shown a chicken in my life, only horses about 20 years ago. I don't know anything about showing- but he's really pretty! Nice little guy but you should not see his wattles. Maybe his beard will cover that as he gets older. I think his biggest problem right now is his age. He does not have the proper markings either but again, may get them. For example, each tail feather is supposed to be tipped with white. He is very nice, just too young yet. Would love to see him in a couple months. Best of luck with him!! I would most def. show him. His color definition is great, his feathering looks very healthy, and his comb has a good definition also. I think your roo would do pretty good in a show. I think his coloring is fine for 14 weeks. He will get even more white with his next molt. It's amazing how much he will change as he matures.